We’re already half-way through Oregon’s football season. This would be good time to take a closer look at our head football coach. 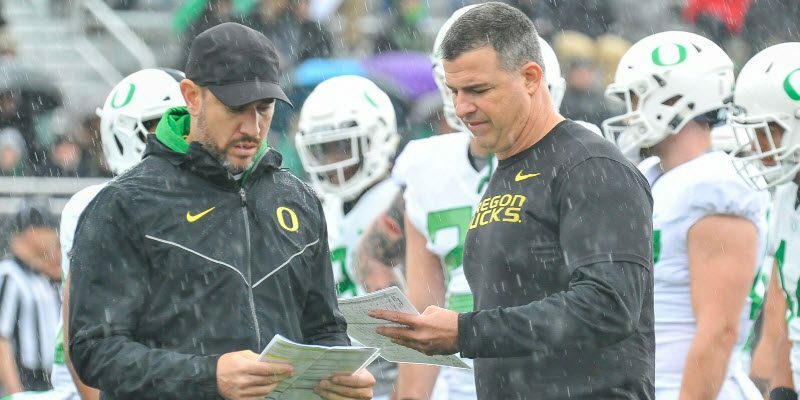 What motivates Mario Cristobal and how are his leadership skills translating on and off the gridiron? Wins and loses are readily quantifiable — an easy metric to gauge. Oregon’s record to date is 5-2, a pleasant surprise for some but nine wins is expected by many. Let’s take a deeper dive to explore and examine the mind of Cristobal. It will enable us to evaluate where he is taking his football team and Duck fans along on this journey toward championships. It is everyone’s ultimate goal! He is a prodigious worker, putting 19-20 hours in each day, in season. To quote Cristobal, “When you’re the guy at the top, no one should out work you. I guess I’ve got to go to 21 hours.” That is commitment! He can recruit in spades — the first key to a successful program outcome. He has the unusual gift of gratitude. “I’m so grateful, indebted to all those who came before me, all those who have sacrificed so much,” he has said. This is clearly manifest on several levels. The first, from Cuban immigrant parents who worked hard, learning a new language with a strong sense of family and an appreciation of a new country, chock full of opportunity. A base and background to admire. The second, an appreciation of traditions, coaches, players, fans, Nike and the University of Oregon, all of whom have paved the way for continued success that preceded his arrival. Cristobal is building on a tradition and foundation already established, for which he is truly thankful. Third, the profound impact of being a HC. The cache and status of making millions, at one of only 128 schools in Division I football. He truly feels blessed with the perks, benefits, influence and challenges to this position. He exhibits integrity. That is refreshing, especially after last season. The majority of players wanted and voted for him to captain the USS Oregon sailing forward during a turbulent and stormy December 2017. A powerful endorsement indeed. Also, he has not (in public) thrown shade on last year’s coach! Coach Cristobal is articulate when speaking and makes good eye contact. He knows the game and communicates it well to fans, boosters and the media. No question seems to fluster him. Cristobal understands the critical importance placed upon him. “You’ve got too many minds, too many lives that are affected by how you conduct yourself,” Cristobal says. He is teaching this to his players. How to work and play on and off the field. Having each other’s back, built and earned by trial, error and vast repetition. Filming all aspects of practice teaches assignment integrity, in with each player knowing specific roles. His slogan is: Be demanding but not demeaning. Establish levels of trust and accountability. A two-way street that must be earned and cultivated. Fewer penalties, better discipline are manifest on the gridiron to date. It is a huge priority. 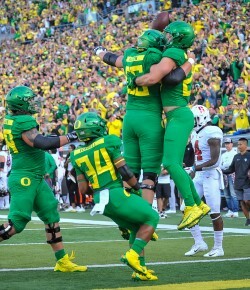 The Ducks celebrate in the endzone. Game management. Will he be an X and O guy, or hire those who can maximize talent schematically, to win championships? Is he able to evaluate talent and place players in positions and situations to increase the odds of success? Will he run a clean program by avoiding the seductive influence of abundant dollars and temptations that clearly exist today? Can he teach these high-testosterone, aggressive athletes to avoid trouble, and to be engaged and integrated into the community as productive people? Physicality. A sea of change has been coming to an O or D line near you. A different philosophy of winning ‘trench warfare’ is in our future is it not?. Are systems and procedures in place to succeed long term? Can he keep, improve and motivate coaches to his particular vision? Is charisma, charm and class in his DNA? Will he endear us to an already established football community? Are the mind and methods excellent enough to take Oregon football to a champion destination? The Orange Bowl in Miami. Commitment. Will he stay, if success, money and Florida beckon him back to the Sunshine State, and his roots? Finally, when seeking solace, does he have the support of his wife, children, close friends and his faith to endure the opposition waiting to block the path? When challenges, adversity, extreme pressure and that daunting loneliness of being the Tip of the Spear come crushing down on this man, how will he react and respond? Relationships will be critical to long-term achievement in Eugene. Will he enhance them with players, coaches, fans, media and community? There are so many questions to be answered by season’s end. 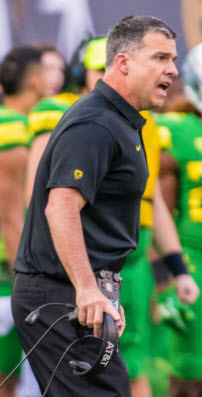 It will be fun to watch and learn just how his process to greatness unfolds as the Head Man of our Ducks. Look for articles immediately after the games for the rest of the season, including late tomorrow night; the objective is to get the conversation started about the game, and the article will flow into Sunday!